With patient care as our top priority, Dr. Frial and our team ensure that our patients receive the most advanced orthodontic care possible. We believe it is important not only to meet, but to exceed the standards of orthodontic care. At Frial Orthodontics, you will not only enjoy the orthodontic process, but you will receive a smile that will change your life. Through Sesame 24-7™, we can send telephone, e-mail, or text messaging appointment reminders. Patients can also check their appointments and account balances securely online, as well as their photographs and X-rays. We value our patients’ time, so we have created systems that help us run on time, such as our computerized check-in system. We can look at the computer screen and know, in an instant, how we are doing on each patient. We have a game room, raffle prizes, and create fun contests. Patients actually look forward to coming to their orthodontic appointments! We are committed to staying abreast of the latest advancements in technology. For added convenience to our patients, we take our own digital photographs and X-rays instead of outsourcing to an X-ray laboratory. Our service and communication is outstanding. From the first greeting to the last moments you are in our care, you will receive first-class service with the utmost personal attention. We recognize that every patient has individual needs and desires. 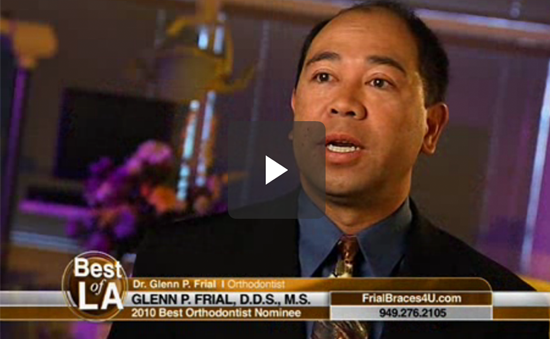 Dr. Frial custom-designs treatment for each and every patient. We work hard every day to go the extra mile to provide the best for our patients.